Zaraysk or Zaraisk or Зарайск is part of the Kostenki / Avdeevo group, and is the northenmost example of this culture. The site dates to between 22 000 and 16 000 years ago. The inhabitants were living in a peri-glacial tundra environment, but could call on the rich flint and animal resources of the area at that time. Wood was scarce, but flint, bone and ivory were plentiful, so that raw materials for food, fuel and tools were readily available. 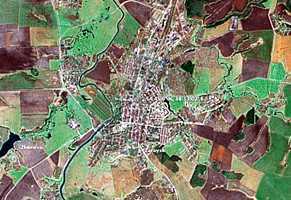 Zarysk is at 54° 45' 55" North, 38° 53' 1" East, about 150 km south of Moscow. Dig at Zaraysk in the shadow of the castle, or Kremlin. Old plan of the castle, or Kremlin. 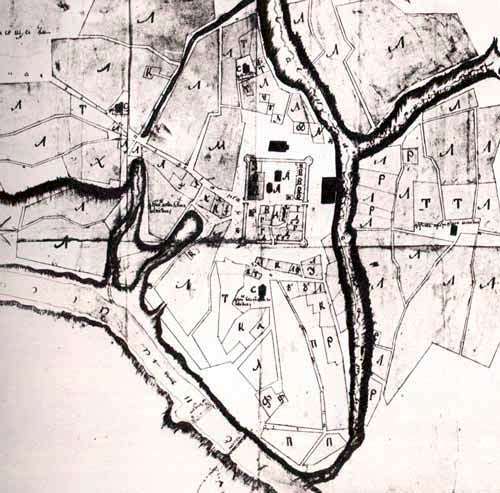 1) modern buildings; 2) park; 3) trees; 4) walls and tower of Zaraysk kremlin; 5) test pits; 6) road; 7) excavated areas. 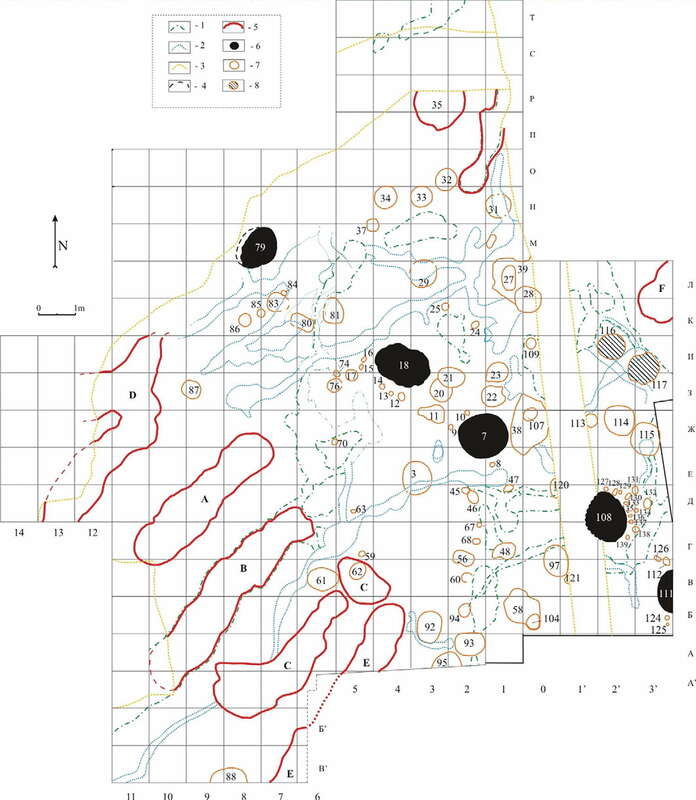 1) frost cracks of 1st generation; 2) frost cracks of 2nd generation; 3) trenches, destroying cultural layer; 4) presumed limits of features; 5) limits of large pits (earth-dwellings); 6) hearth; 7) pit; 8) pits with figurines. Much of the text below has been translated and adapted from the Russian language Wikipedia website (http://ru.wikipedia.org/) on the Zaraysk dig. Zaraysk is a monument of world importance. It is in the heart of the ancient Russian city of the same name. It is part of the Kostenki - Avdeevo culture, the Eastern Gravettian. Archaeological excavations at the site were conducted during 1980 - 1989 by A. V. Trusovym, and then resumed in 1995 and continued under the leadership of Dr Hizri Amirkhanov, from the Institute of Archeology, Russian Acadamy of Sciences. The director and head of field operations since 2000 is C.Y. Lev. Dr Amirkhanov changed the techniques of the dig so that there was a much greater emphasis on stratigraphy, as well as including the input of specialists in the fields of geomorphology, palaeontology and geology from Russia and from overseas. 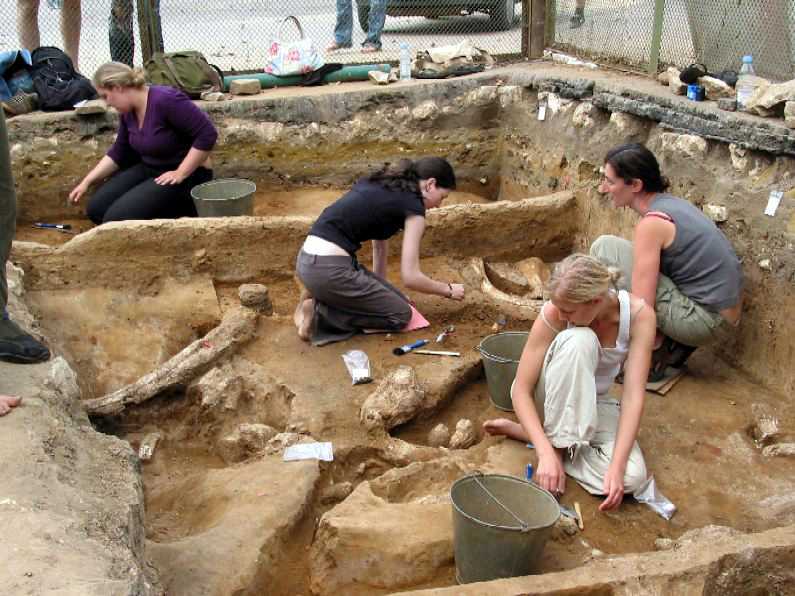 (left) Students from Great Britain at the Zaraysk site in 2005. At suitable places in the digs, vertical walls were left so that the stratigraphy could be further investigated and correlated with the finds. This significantly complicated the efforts of the researchers in the field, but significantly increased the quality of the finds. 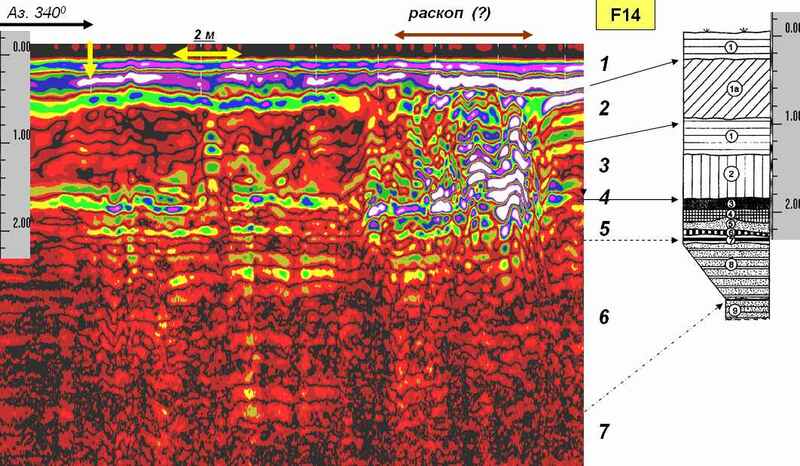 By studying the permafrost cracks which damaged the cultural layers, the sequence of events as the ice advanced and retreated was determined, with evidence of habitation disappearing with the ice, and reappearing in slightly warmer times. With the discovery of female figurines in 2005, the allocation of the Zaraisk / Zaraysk site to the Kostienki-Avdeevo culture is in no doubt. It is worth noting a sculpture of a bison, in a style completely unknown in the Gravettian. 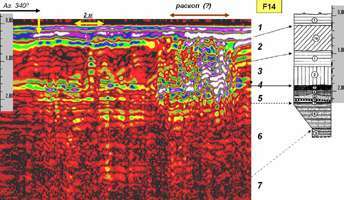 There is a large spread of radiocarbon dating and many microstratigraphic details raise the issue of continuity of tenure of the site. More than 20 dates between 15 600 ± 300 BP and 23 000 ± 400 BP were obtained. By 2006 the total area of the dig was about 450 m2. Zaraysk residents have often found bones and flint tools in the area. 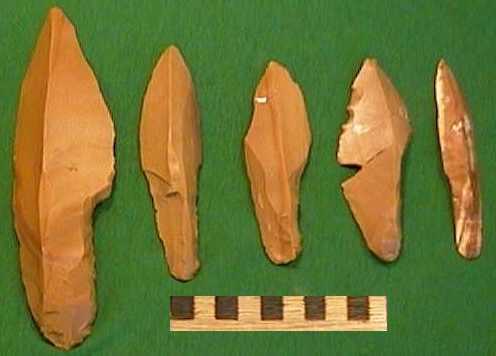 The first flint artefacts found are held at the Zarysk Museum. During the period 1980 - 1989 more than 15 000 artefacts were recovered, including many examples of the iconic "Kostenki knives". 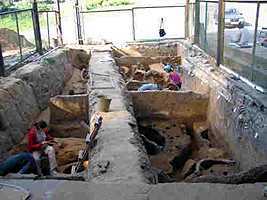 Dr Amirkhanov made further discoveries, and it was agreed that the excavations once complete would be backfilled with clean sand, and some large bones left in place, so that in future a Zaraysk Archaeological Museum could be opened, as has been done at Kostenki. Most of the archaeological site is in the middle of "The Cape" which is the upper surface of a river meander and a large ravine. The excavations are in the region of the northern wall of the 16th Century Zaraysk Castle. Despite the fact that much of the site was destroyed by the castle and the outer wall, a large portion of the central area of the settlement is still untouched by these constructions, and is the focus of the excavations. Four stages of settlement have been identified, ranging from 15 000 - 17 000 BP to 22 000 - 23 000 BP. The "classical" period, the second phase, was very close in age and identical in artefact assemblage to Kostenki 1. (left) One of the smaller storage pits from the first phase of occupation, with flint blades at the bottom. The roof seems to have been made of mammoth ivory, covered with hides. Near the dwellings were excavated storage holes with a diameter of 50 cm and a depth of up to 1.5 metres. They were usually covered with a mammoth shoulder blade, over the round hole. This structure also occurs in Kostenki 1 in the vicinity of two neighbouring dwellings. Necklace made from the teeth of the arctic fox. The third phase of the settlement is also important, but with a shallower layer up to 20 cm deep. The cultural layer is strewn with large bones, most of them remnants of dwellings. The skull, lower jaw and teeth of the mammoth provided the building blocks. The fourth phase of the settlement is in the last part of the late Palaeolithic. Ironically, the cultural layer in this later stage was the least well preserved, perhaps due to its proximity to the modern surface. Organic artefacts found in the soil were poorly preserved, and mammoth bones were found mostly in the form of dust. Clear data on the housing and settlement of this phase has not yet been able to be gathered, since the data is insufficient at this time. A.V. Trusovym found several hearths which suggests dwellings. Thus the study of this cultural layer in conjunction with the remaining upper soil is promising. 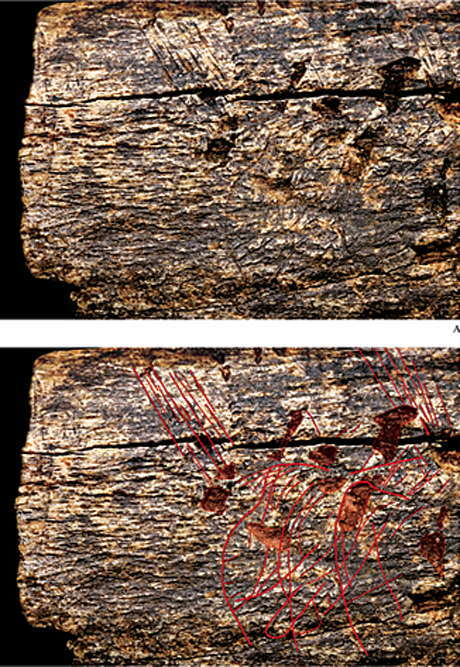 New artefacts, discovered by Hizri Amirkhanov and Sergey Lev of the Russian Academy of Sciences, (and reported by the BBC in December 2008) include a mammoth rib inscribed with what appear to be three mammoths, a small bone engraved with a cross-hatch pattern, 22 mm long (left), and two human figurines presumed to be female. Another version of the small bone fragment with 'oblique cross' engraving found in pit 117. (The scale is graduated in cm and mm). 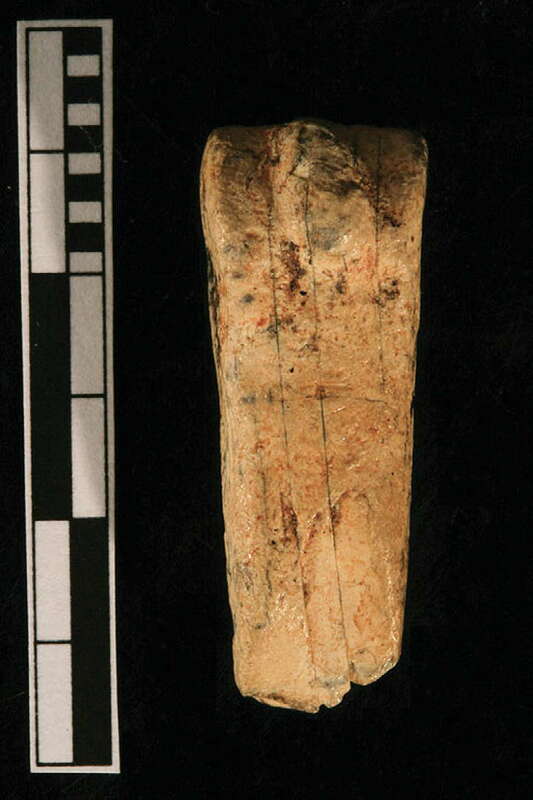 It is a small incised fragment of thin tubular bone (probably of a bird). The ornamentation in 'oblique cross' was applied by deliberate movements of what was probably a sharp angular flint tool. In the 'Kostenki' culture, ornamentation of this kind is found in the decoration of handles and the upper parts of spatulas, needle-cases, bracelets, zoomorphic pins and sometimes large bone points. 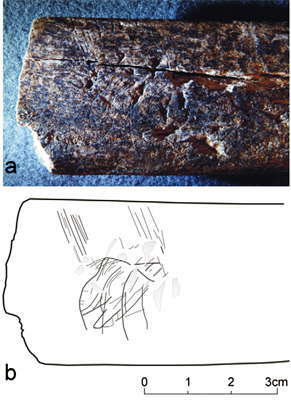 Engraved image of a mammoth, original in the top photo, and with the engraving outlined, below. 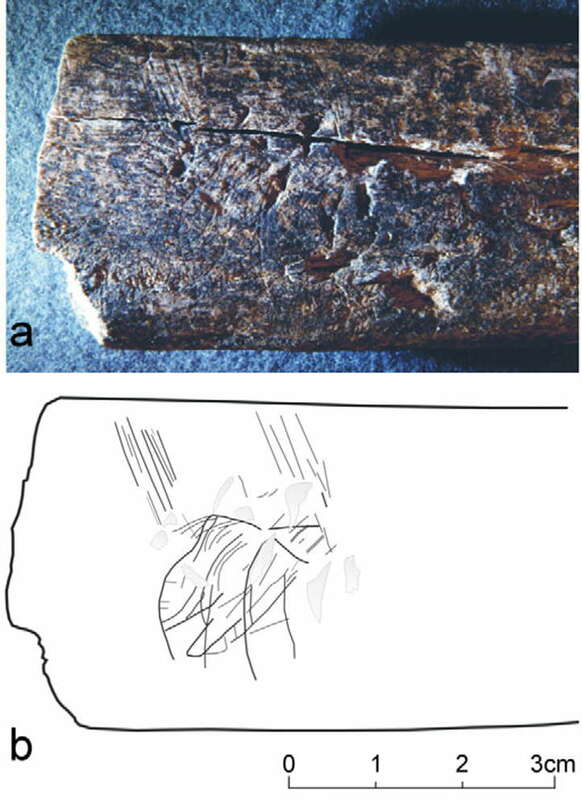 a) Fragment of a mammoth rib with incised figurative pattern, overall length=18cm. The carving covers a small area on its flat surface, carving length = 30 mm, width = 25 mm. b) interpretation of the engraving, with later injuries. 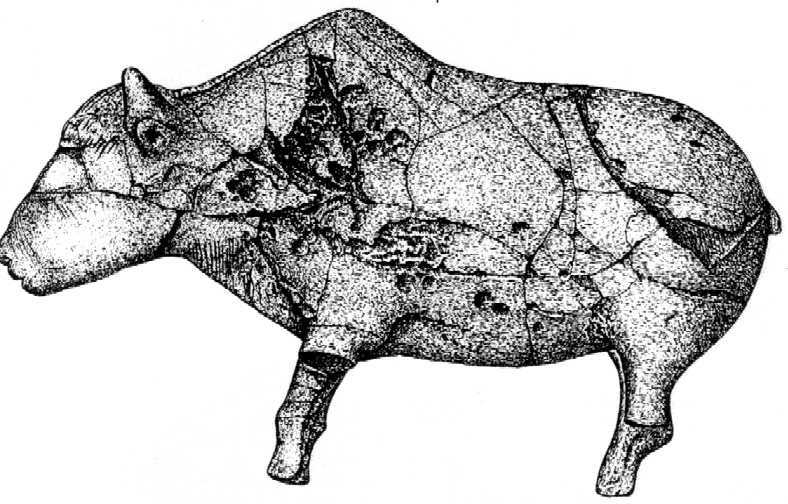 The only example of figurative engraving at the Zaraysk site was unearthed in the middle part of the infill of storage pit 117 near Figurine No.2. The carving is thin and shallow, and not immediately noticeable. Nevertheless, the main lines of the image are clear, not ragged; they were made by confident, unbroken movements. There is a certain hierarchy in the intensity of the lines. The lines that form the contours of the image are wider and deeper, while those relating to the details have less emphasis. It is possible to discern the images of three overlapping mammoths, moving from right to left, with the trunk and head, the back and presumably the tusks outlined in each case. Two groups of lines form ‘tufts’ directed towards the heads of two mammoths. Stylistically and artistically this image relates to the second style of Palaeolithic art (Leroi-Gourhan,1995). The area of the images has been damaged with a series of holes with ragged edges, which could be the result of impact of a sharp tool. This action is confined to the engraved area: there are no traces of piercing on the rest of the object, although it is six times as large as the engraved area. 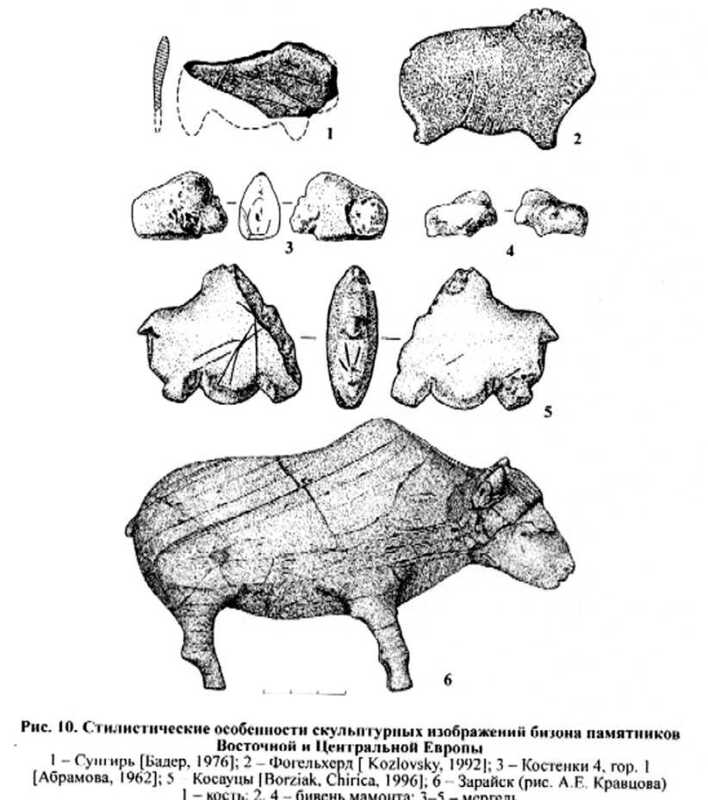 Thus, the engraved image from the Zaraysk site, along with the bison figurine, provides an example of the use of art pieces for magical purposes. Carved image of a hare or arctic fox metapodium made of mammoth tusk. (The scale is graduated in cm and mm). Also among the finds was an object carved from mammoth ivory, shaped like a cone with its top removed. The cone is densely ornamented and has a hole running through its centre. 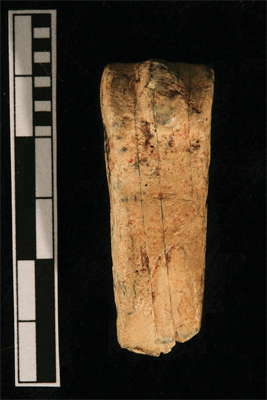 The authors note that the object is unique among Palaeolithic artefacts. "The function of this decorated object remains a puzzle," they say. The top is 22mm in diameter; the diameter of the base is 37mm. (What it does look like is a spindle whorl, used for spinning fibres. However there seems to be no evidence of articles made of spun fibre, but the shape is certainly right. Mammoth ivory has a density of 1.7 to 1.85, nearly twice as heavy as water, so it is certainly feasible. The new artefacts include a mammoth rib inscribed with what appear to be three mammoths, a small bone engraved with a cross-hatch pattern, and two human figurines presumed to be female. 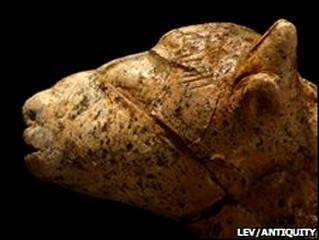 "The finds enrich the inventory of Upper Palaeolithic [portable] art and broaden the known distribution of specific types of art objects in the East European Upper Palaeolithic," Dr Lev told BBC News. "In terms of the splendour and variety of its art pieces, Zaraysk is on a par with such famous sites as Kostenki and Avdeevo." At Zaraysk, the two figurines were found carefully buried in storage pits. Underneath each was a round deposit of fine sand toward the south; toward the north, there was a deposit of red ochre - an iron-based pigment. One is presumed to be finished and stands at a height of nearly 17cm (6.7in); the other is clearly unfinished and about half as big. However, both resemble examples of such statuettes found at the Avdeevo site to the south-west, suggesting cultural links between the two. "This collection of artefacts is spectacular in a number of ways, not only for the range of representations of both humanistic and animal but also for the range of materials that is used," says Jeffrey Brantingham, an anthropologist at the University of California, Los Angeles (UCLA). "These finds are really incredibly rare, and they offer a unique picture into human Upper Palaeolithic life." The large number of mammoth bones found at the site raises a lot of questions about their origin. It seems highly unlikely that such a large number of bones was the result of hunting. Given that a large number of bones were burned in the pits (since in the peri-glacial tundra of those times there was little if any wood available) this indicates that the settlement was of a relatively small tribe of several dozen people. The numbers could not get much smaller, given the harshness of the climate. The bones were apparently near the site, possibly from "cemetery" mammoths which were killed or drowned in the nearby river, which at the time was much deeper than it is now. These may have washed up at the nearby bend in the river, and the bone was gathered from there. It is noteworthy that almost all the tusks were used as building material and have similar sizes, which indicates their pre-selection. Support for this hypothesis is that many of the bones at the site are several thousand years older than the age of the cultural layer. (left) Mattock made from a mammoth tusk. Besides mammoth bones, the bones of deer, hare, bison, birds and rodents were found. 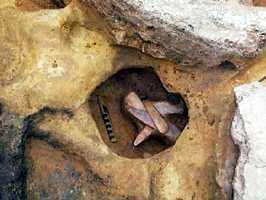 The small bones were used for needles and awls, the large ones were used as mattocks for digging. There were many paws of the polar fox found. Most likely they were retained or used as a decorative element for fur clothing. 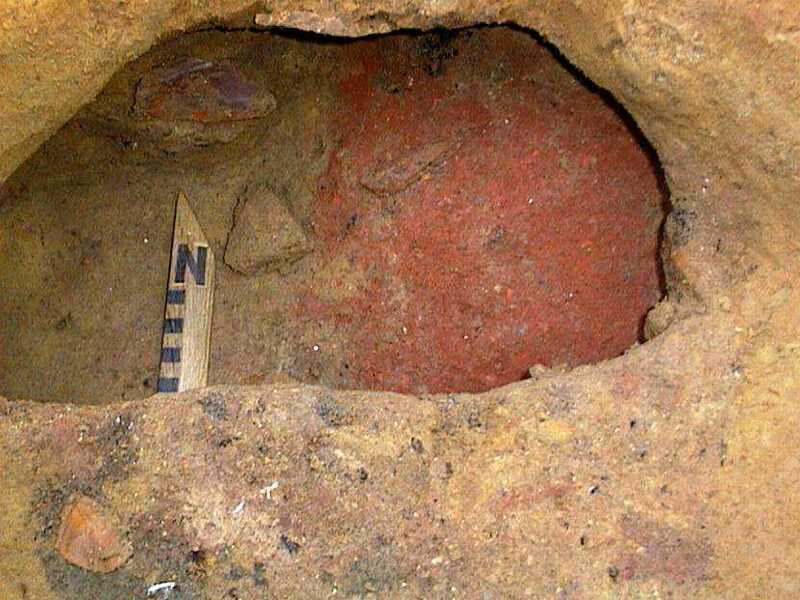 (left) Ochre in the bottom of a storage pit. An important element of the spiritual life of the settlement was red ochre, which was apparently made by burning iron concretions which are found in large quantities nearby in sandy sediments. They scattered ochre at the edges of the dwellings and marked storage pits -"кладики"- with it. Sometimes the ochre was mixed with clay. A large number of ceramic fragments were found, often mixed with ash. Their purpose is not clear. Perhaps they were attempts to manufacture ceramic handicrafts. (left) Shouldered points, with the base of the point reduced in width to make it easier to attach to a handle or a spear. 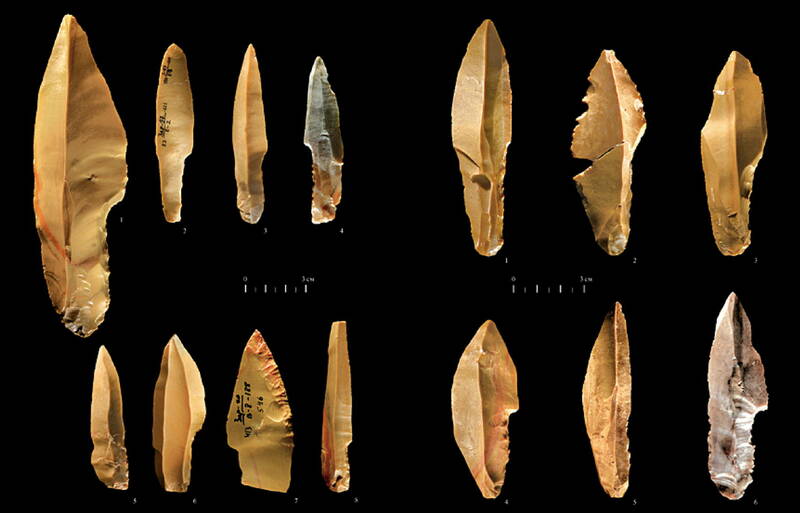 The Zaraysk site is extremely rich in flint artefacts, with tens of thousands of specimens found. 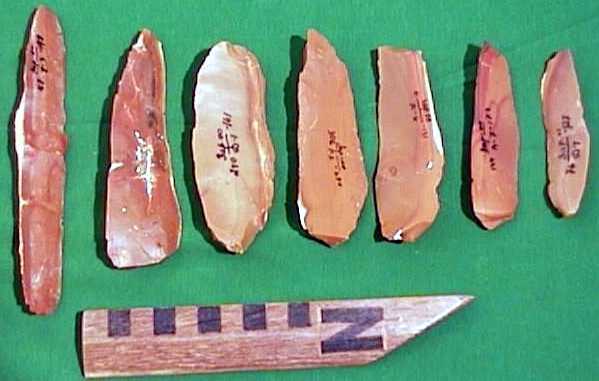 The availability of basic raw materials such as flint is an important factor in determining the specific character of a site. This radically distinguishes Zaraysk from other sites such as odnokul'turnykh / однокультурных which is considerably remote from raw materials. The proximity of flint resources made it possible not to economise on raw materials. Thus it is possible to meet points which are 16 cm long, and blades with a length of more than 30 cm. In the 2001 - 2002 season a pit from the third phase was found which was completely filled with large flint nodules with masses up to 4 kg each. 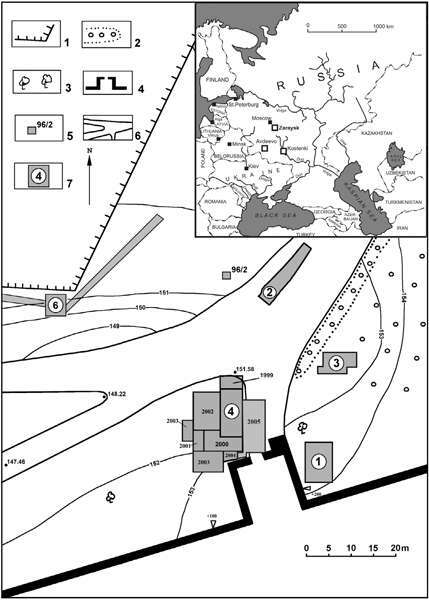 This makes it possible to speak, if not about megaliths, then at least about macroliths with respect to the flint inventory of Zaraysk. Shouldered or tanged points, with the base of the point reduced in width to make it easier to attach to a handle or a spear. These are typical of the Kostenki / Zaraysk culture. The vast majority of flint material is waste spall, or debitage. Chips of flint are extremely abundant. Evidence suggests that the chips were not used for tools, they were only a by-product in the formation of the tool. (left) Kostenki type blades found at Zaraysk. 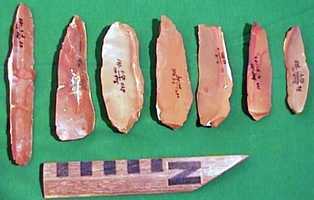 The technology of flint knapping, thus, was directed towards obtaining a flat lamellar blade, as at Kostenki and Avdeevo. Specifically, it was from blades that most tools were formed. Among the types of tools found are Kostenki type knives, shouldered points , and also blades with a blunted edge, or backed knives. Some of these tools belong not only to the Kostenki-Avdeevo culture, but also to the entire Kostenki-Willendorf culture. Microliths (very small stone tools usually made from sections of small blades) with a blunted edge are an interesting form of a small tool which can be used as inserts into a bone or wooden mounting for making a composite tool, such as a harpoon. 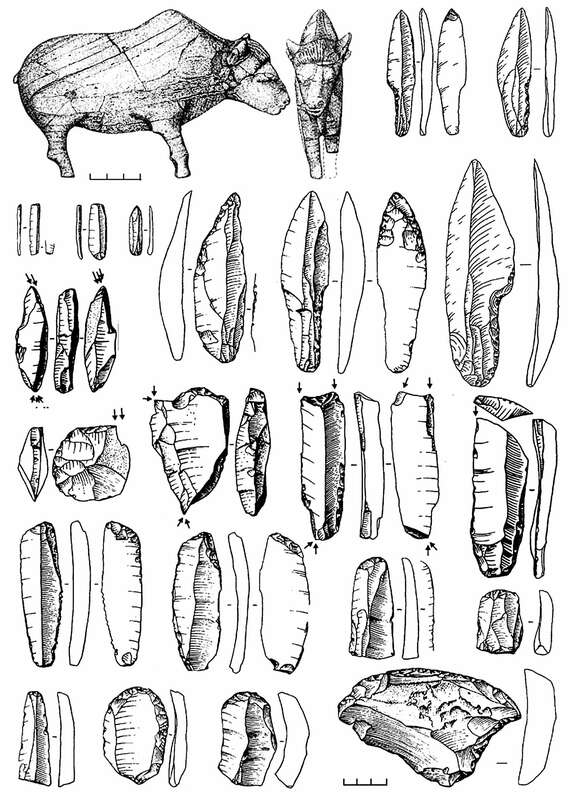 Among other tools should be noted a large number of knives of different types, as well as scrapers, burins, points and hammer stones. At this point no human bones have been found, with the exception of the milk tooth of a child found during sorting and washing. The evidence of the first phase occupancy was the least well preserved, since they were modified by later constructions and by permafrost. It is possible to determine, however, that there was a well structured settlement, and in particular there was a line of storage holes around one site in which were found mammoth bones and a statuette of a bison, shown left. 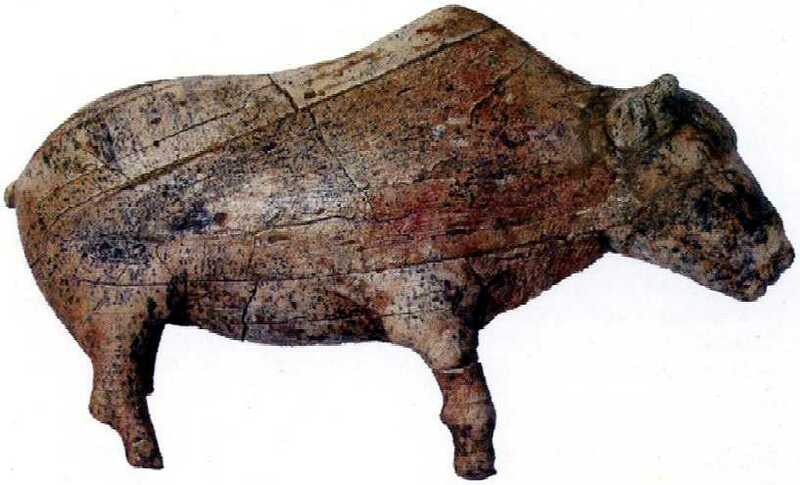 This naturalistic statuette of a bison made from a mammoth tusk and unearthed by Sergey Lev was the first significant discovery to place Zaraysk on the same level with the best known Palaeolithic sites of Europe. It was found in September 2001 during the excavation of Pit 71. The left side the body was damaged by a sharp object, it was densely coated with red ochre, and both left legs were broken off, as can be seen in the drawing at left. Apparently the statuette was damaged and put into the pit deliberately. 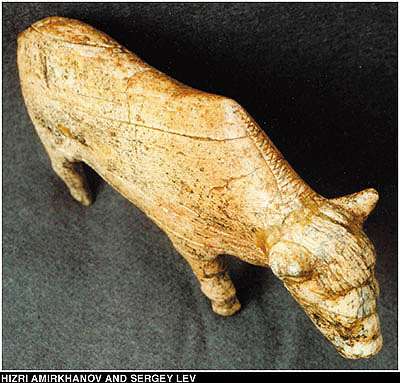 The conclusion that Dr Amirkhanov and Dr Lev came to was that the burial of the statuette of bison occurred during the course of a magic hunting rite. It was broken deliberately, so that the magic would stop the actual bison from running away in reality. 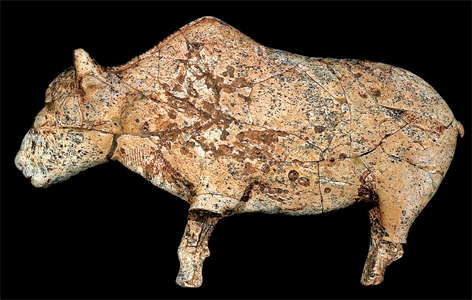 In favour of this interpretation is the fact that the primitive sculptor depicted not an adult male bison, but a young female, which is more easily hunted. The close similarity of the image to the original would have been believed to contribute to successful hunting. "pit 71" is part of the earliest stage of the population of the site, phase one, which places the age of statuette at 22 000 - 23 000 BP. 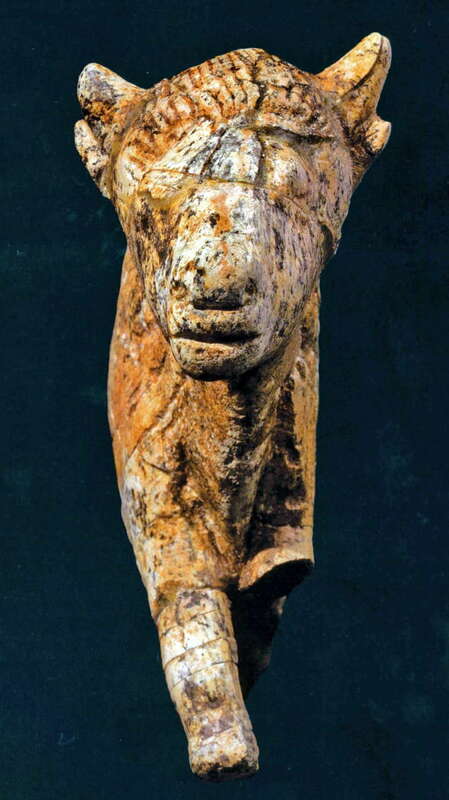 The figurine was found on a specially built podium at the bottom of a small storage pit. 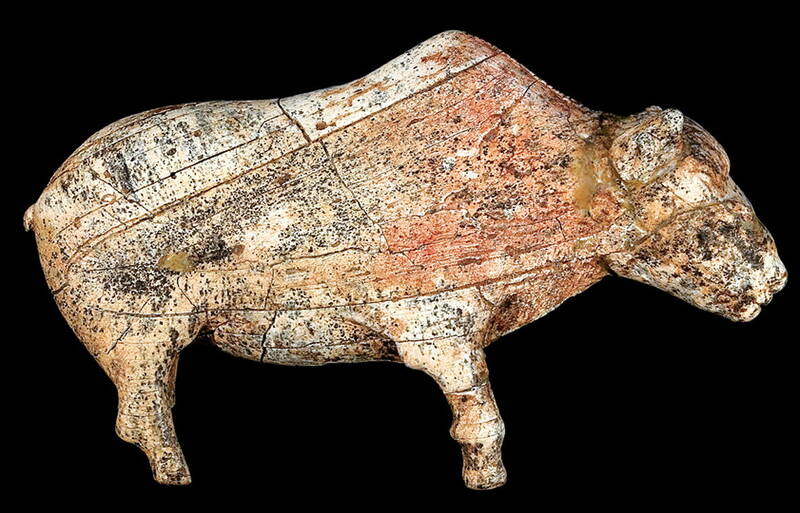 The figurine has a length-to-width ratio of 1.6:1, which perfectly coincides with that of an adult bison, and its beard and mane were carefully engraved. The bison's left legs had been broken off before it was put in the pit, and traces of red ochre and black pigment still remain on its surface. Close up of the head of the bison. The bison was carved from a mammoth tusk. Length 164 mm. Another view of the superbly proportioned bison. The open-air Upper Palaeolithic site of Zaraysk is located in the center of the town of Zaraysk, about 155 km south of Moscow. The Zaraysk site is the northern most known occurrence of the Kostenki-Avdeevo archaeological culture (Gravettian tradition) on the Russian Plain. The common feature of Zaraysk and other "mammoth hunter's" sites of Russian Plain is the presence of woolly Mammoth (Mammuthus primigenius Blumenbach, 1799) remains, which makes up about 96% of the total number of mammals bones. 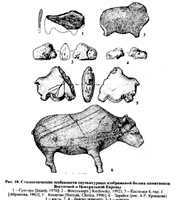 But, long-term researches in Zaraysk gave evidence of some special features in mammoth exploitation that we will discuss. A specific variety of mammals on the site is rather limited. Among the large Mammoth bones discovered, skulls, lower jaws, ribs and scapulas are the most common. 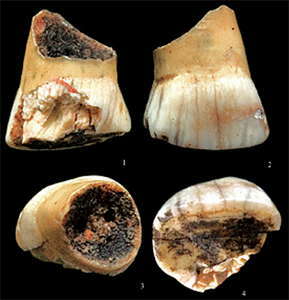 There was also a large quantity of isolated teeth and tusks. 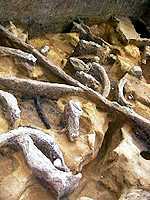 Long bones are rare and usually only fragments are found. 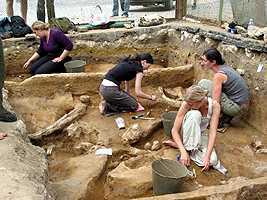 Whereas, on other sites of Russian Plain, most Mammoth remains are long bones, vertebras, and bones of distal parts of the legs. Most mammoths hunted (more than 23 individuals) are adults and excavations during the 2005 season (42 m2) yielded the remains of 16 adult individuals. Bones of young mammoths including calves and infants, usually numerous at similar sites on the Russian Plain, are less common (2 individuals found in the excavated area). There is still an open question on the importance of the woolly Mammoth as a hunted species by the inhabitants of the Zaraysk site. Collecting of bones of the perished animals does not negate the reality of their hunting. A large number of Mammoth sites demonstrate that this animal was the basic natural resource in various kinds of human activity, but there is still no evidence of the butchering process. The Zarayskaya site is an archaeological monument of world importance, the northernmost habitat of ancient man (Kostenki-Avdeevo culture) during the last glaciation (22-17 thousand years ago). There are many traces of ancient life here - so many stone tools, bones and tusks of mammoths and other representatives of Paleolithic fauna, and unique archaeological finds - many homes and even works of art of ancient man. 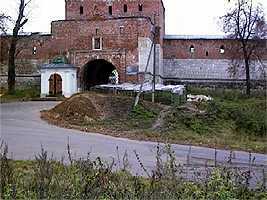 Most of the site is under the Kremlin walls of Zaraysk or overlaid by asphalt on the square in front of the Kremlin. Only a small portion of the monument was excavated under the leadership of H. A. Amirhanova. Such an object is extremely difficult for geophysical surveys, we know only of sporadic cases of earth radar use in overseas Stone Age monuments. This site demonstrates those difficulties, highlighting the problems of differentiating the various lithological elements, and the lack of contrast of objects of artificial origin. When interpreting experimental materials from the site and comparing them with archaeological data (J. A. Amirkhanov, 2000) managed to trace the stratification of the section in most parts of the monument, separate medieval layers of sediment, trace levels of buried soil, differentiate two layers of soil, localized sites of previous archaeological excavations and modern communications, and other features of the underground area. Leroi-Gourhan A., 1995: Préhistoire de l’art occidental, revised and updated edition of original 1965 edition. Paris: Citadelles & Mazenod.